The answer to the last question is no, not necessarily. Unfortunately we can’t spot reduce fat, and that is what is covering that mysterious six pack of yours. We can’t do exercises that target weight loss from a particular part of our body sadly. This would make life far too easy. The answer is to learn how to engage the core in every exercise you do. There are many reasons you should aim for this. The first being that it will stabilise any other movements you are doing whilst ensuring proper posture, it will improve any lower back pain almost immediately and your core will get stronger and more reliable once you start learning to work with it not against it. The core muscles will become stronger and work harder, the longer they are held under tension for. For example doing one minute of sit ups as fast as you can will only engage the core for about half of that time, because much of that minute it isn’t being used and momentum is doing the job for you. If you were to perform an exercise such as walking lunges with a lateral rotation, engaging in the core all the way through the motions, there is nothing to say that the core won’t work for the entirety of the movement. This could be 2 minutes non stop. Without engaging the core for exercises requiring rotation, you will find that your balance is off and you struggle to complete the set in control. How do I engage my core? So often it’s because people rush and forget about their core that it is not engaged. Stop and think before performing any exercise. You must make sure you are starting in the right position, with the right posture first. What you need to do is pull your core in and up, aiming to straighten out your spine. (imagine trying to do up a tight pair of jeans) To help with this, you must try and tilt your pelvis into a neutral position to minimise the curve in your lower back. 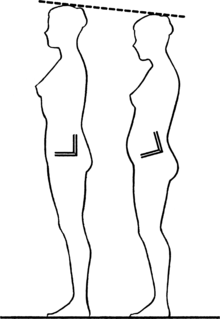 This pelvic tilt is shown in the picture on the left. You can see that immediately she stands taller, with her stomach pulled in. The figure shows a neutral line from the head all the way down the body which cannot be achieved had she left her head hanging down. All of these points need to work together to engage the core. This same shape applies in the horizontal position for plank and other similar exercises. If you can do this before each exercise, you will find your core will work much harder than it ever has before and there is no need to waste your time doing hundreds of sit ups and crunches. Lunges, squats, mountain climbers, kettlebell swings, shoulder press… all these movements will work your core IF you do them properly! Before you start any exercise, stop and think about your posture. Don’t rush, look in the mirror and check your positioning is correct first.